Such stations are great not just because of aesthetics, but also because they work efficiently, serving the movement needs of masses of people in a way that makes good use of both limited space and limited funds. They provide a great aesthetic experience to enormous numbers of people at once, while also moving these people along on their journey. Their efficiency is an inseparable part of what makes them inspiring places. In short, great urban design for transit must provide great sensory experiences while still serving the purpose of transit, which in most cases is to help large numbers of people move freely through a city without cars. It would seem reasonable, then, that an urban designer could be expected to know a bit about what counts as efficiency in the transit business. But no. Note the passing reference to practicality. Nordahl asks the question here but never returns to it. Nowhere does he show any interest in what various transit technologies cost to build and operate. Nowhere does he suggest that ridership may have anything to do with the travel time we offer and the fare we charge. Instead, he offers a purely aesthetic rumination about the most famous tourist attractions in the American transit industry, from the San Francisco cable cars to the Seattle and Las Vegas monorails. 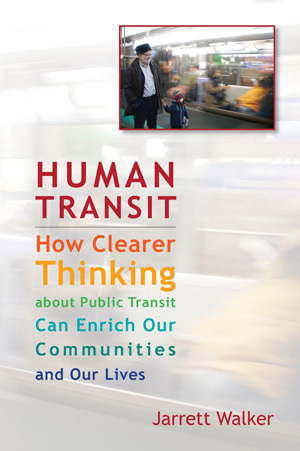 Such ruminations have an important place in the literature of urban design, but they are far removed from the practical business of transit, and are unlikely to influence it much from such a distance. A passenger vehicle that travels a mere ten miles per hour, such as the New Orleans streetcar, may be anathema to current transportation ideology. … Time that is lost to the destination, however, is time afforded to the passenger to people-watch, window-shop, and sightsee … A slow-moving transit vehicle adds welcome animation to the street, drawing people to it, unlike a fast one from which safety-minded pedestrians keep their distance. The urban design point is undeniable. Relative speed is a dominant factor in the perception of safety, so slow-moving vehicles feel safer than fast ones. But is this really our primary concern in choosing transit technologies? Quick: You have a meeting at 8:00 AM tomorrow. Will you set your alarm at 6:00 and take the boring old subway, or set it at 5:00 so that you can ride a 10 mph service that offers you the chance to “people-watch, window-shop, and sightsee”? We should all understand the emerging ideologies of slowness, but we’d surely deserve ridicule if we proposed such an ideology to a Rapid Transit agency or the High Speed Rail commission. Nordahl’s book is also a fine example of the great fallacy of transit tourism. Political leaders frequently take junkets to other cities, ride those cities’ transit systems as tourists, and then come home proposing to build the same kind of service. But our values as tourists are different from our values as commuters: We enjoy riding the Ferris wheel, but that doesn’t mean we’d enjoy commuting on one. There certainly are times when we travel in our home city in a recreational way, with the primary goal of pleasure, but most of the time we really need to get somewhere, because a treasured or necessary part of our lives is on hold until we do. are civic space, and they must be designed as such. Most of the values that he elucidates and defends — such as scale, style, transparency, lighting, and connection to place — should be considered in every decision about the design, procurement, and fitting of transit vehicles. But these experiential values cannot expect to rule on matters such as frequency, speed, and staffing, as Nordahl proposes to do, because those factors are the dominant cost-drivers of transit; they will always be governed largely by what provides the greatest possible mobility at the least possible cost. Nordahl regrets that driverless high-frequency metros (such as Vancouver’s SkyTrain) lack a human presence who will acknowledge us and answer our questions, but in a business whose costs are dominated by labor, we could only add such people by drastically reducing the mobility and capacity that those systems provide. This is the real-world tradeoff implied by Nordahl’s thinking, but he never discusses it. of its design. But we still need to get there, fast and affordably. Our jobs and our children are waiting. Photo of Grand Central: By Diliff, horizontal correction by Janke, from Wikipedia. This is a really good post. I initially passed it over not caring to read about Disneyland but was pleased to find you challenge the novelty notion that is so prevalent among persons interested in cities and urban design but far removed from the realities of making transit work for the most number of people. I think Nordahl is right to cast more attention on the aesthetics of public transit. Personally, he all but loses me by making the “Disneyland” appeal. Maybe this is me reading a little too much J.H. Kunstler, but the Disney experience has done probably more than anything to irreperably scar humanity. Notice how Disneyland came to being when baby boomers were still kids. The boomers, as they came of age, sought to synthesize the Disneyland experience to every facet of life. They in effect wanted a carefully programmed and designed simulacrum of reality, rather than reality itself. I could understand wanting to get away from the uglier parts of the human condition, but in the process of getting away from it all, we’ve forgotten how to solve problems or even how to comprehend them. The problem is when reality manages to seep through the cracks and creates a friction with Fantasyland. I am glad you brought up San Francisco. I was there less than a month ago, and not only is it one of the most genuinely beautiful cities in the world, it is a petri dish of transportation that should be examined under a microscope to be appreciated. Everything what most people regard as great about San Francisco transit are also the city’s biggest liabilities. Take BART … please. This is mass transit’s equivalent of what the neocons who brought the world the Iraq war call a “catastrophic success.” You can’t separate how well it performs from how many things it does awfully. San Francisco deserves more rail transit, even though it has plenty of what looks like steel wheels on steel rails. You can go everywhere on trains, as long as you are on Market Street. When it is above ground, the trains act like buses. When I saw this, I was amazed. I wasn’t disappointed by how slow and unreliable Muni Metro is. I was actually astonished by the versatility of the Muni Metro cars. One vehicle was suitable for three different types of service! This is far more technologically beneficial than BART. You’ve seen a rising amount of interest in bringing back streetcars, as in rail cars with the performance characteristics of buses rather than modern light rail (i.e., high-frequency mid-range interurban trains). We have a working, albeit unreliable template, in the Muni Metro Breda vehicle. With orders large enough, the Breda cars can go from niche equipment to generations where subsequent designs improve reliability. The vehicles can operate as high-platform light rail, high-platform heavy rail, and bus-like operations with surface boardings through collapsible stairs. Maybe by crossing the interest in building streetcars with a Muni Metro-type vehicle, cities can design all-purpose rail-based systems that have form and function. I’ve said this elsewhere that monorail has come up, and I don’t want to sound like a broken record, but I don’t see how monorail is inherently problematic as a technology. Yes, switching is slower, but not that much slower. Yes, there’s a proprietary technology issue, but many places (like Seattle and the Scomi technologies that were outsourced from the old ALWEG designs) use technologies comprised of entirely off-the-shelf parts. And, to refer to your article about the relevance of elevated transit, monorail is designed to provide elevated levels of service at surface light-rail expense. It has more in common with Vancouver’s SkyTrain than it does with Portland’s MAX, and no one would say that Vancouver isn’t an urbane city because SkyTrain is automated and elevated. I can understand the problems with valuing aesthetics above practical considerations. But if an aesthetically pleasing technology like monorail can also be practical, what exactly is inherently wrong with it? I’m not an expert on the technology. My point here was to critique Nordahl’s way of arguing for it — i.e. exclusively based on the quality of the experience. One major issue I recall from the Seattle Monorail Project is that monorails can’t branch the way conventional rail services can, because the vehicle is wrapped around the side of the beam. Vancouver’s SkyTrain is a fully automated metro, essentially, which is a much more widely used and tested technology for heavy urban transit operations where extendability is a key criterion. … monorail is designed to provide elevated levels of service at surface light-rail expense. If this had been true, then by definition more monorails would have been built. Seattle had to scrap a planned monorail network when its revealed costs turned out to be higher than the spiraling construction costs of its first light rail line. We need to give up the ghost on monorail becoming a viable transportation solution. It has had more than 100 years to prove its value. So why hasn’t it? All of these other technologies were able to gain mass acceptance in a much shorter time frame. You know why monorail is not included in that list? It has not shown any fundamental improvement over conventional rail to warrant a change. What I like about Darrin’s post is that he is advocating matching transit mode to purpose. If you love LRT, then every corridor needs light rail. That may not be so. In Minneapolis, I think the Hiawatha Line is working quite well and I like the service. One can get from Downtown Minneapolis into the airport in 20 minutes. Buses in airports tend not to do well, hindering traffic. Metro Transit, et al, are planning a Central Corridor line which will travel from Minneapolis to St. Paul downtown. I’m not sure this will be faster than current bus service because it travels the same route albeit with fewer stops. Let’s talk about why the public prefers light rail to buses. I’m guessing that some of my preference are shared by other riders. These things I dislike about buses: stepping up, putting money in the fare box, meanwhile the bus is starting up, the smell of diesel, the crowdedness of buses, and the jerky motion. Modern LRT is clean, quieter, has a better ride and I feel more comfortable than in a bus. I don’t feel claustrophobic unless the LRT car is extremely crowded. Darrin is right that many aspects of LRT experience can be incorporated into buses at less capital expense. These would make sense on routes where there is no speed benefit to LRT. As a taxpayer, I don’t favor LRT only for development benefits and rider comfort. I do want speed in a transit system. IF PRT actually works in airports (starting at Heathrow) and other applications which can benefit from distributing rather than massing riders, we will have multiple options. Darrin doesn’t like anything above ground, but I will accept above ground if speed and comfort are dramatically improved. Averaging 25-30mph non-stop is a dramatic improvement over buses(15-17mph) and light rail (20-22mph) for certain purposes. I think the issue is thinking through the benefits and costs of each transit mode for the service any city wants to provide. Aesthetics is one part of the mix. Mobility and speed must be part of the mix for non-tourist attractions. What would San Francisco be without cable cars? However, for daily transit commutes, other options are superior. Counting riders is one measure of success, but it is important to look at what each mode does and fails to do. We have limited resources and electricity is likely to be the most sustainable power for transit. My vote is for LRT, heavy rail, streetcars, electric trolley buses, and PRT where each does something which is desired that other modes cannot do. Please cite some examples of "very fast transit with very few riders." The only examples I can think of in your region are transit lines that have other obvious network design faults, such as the Dublin and SFO airport BART extensions. Your argument is so extreme and counterfactual that I want to feature it on my blog as an example of an important subset of urbanist thinking, but in the spirit of engaging in conversation, rather than attacking you. If you say no more about it than what you've said, your argument will seem self-refuting to transport professionals, since it's contrary to so much observed behavior on both transit ridership and public opinion. Without picking on the OP, whose intentions I have no way to discern–many people commit the fallacy of assuming that “everyone” (or at least a plurality of the people) think the way they do on some matter–even in the presence of evidence to the contrary. Many people socialize with others of similar viewpoints, and its easy to find echo chambers all over the world, amplifying dubious claims such as “nobody likes to eat at McDonalds because its crap” (I’ll ignore the latter clause of that sentence as a matter of opinion, but the first part is demonstrably false), or numerous opinions on the merits of busses vs streetcars. The latter one goes both ways, of course–those who have no issue with busses have a hard time acnowledging the existence of People Who Don’t Like Busses, and those who don’t like busses seem to think that nobody with a choice would ride one. To be a transit planner is, in many ways, to be a scientist. Not a researcher, necessarily–but a designer, an engineer–and this means use of an empirical approach wherever possible. I have committed the sin of “I think” (wherein one attempt to assert an uninformed opinion as fact, couched with a qualifier) many times myself; the sins of “most people think” (where an unsubstantiated consensus is asserted) or “experts think” (where authority is appealed to but not cited) are also equally sinful. You’re right, I’m not a transportation engineer, or a transportation planner for that matter. But I can actually give a concrete example where a slower system is favored over a faster one because it is more pleasant, and that is the F-line in San Francisco. Non-tourists often choose to ride the streetcar over the faster underground system because you get to see life as it passes, and have fun doing it. Riders from the Castro to the Ferry Building sacrifice 10-15 minutes for the joy of it. Reading back over your blog entry, I actually agree with much of what you’re saying. Of course efficiency, speed, and practicality are part of the equation. I just think you’re wrong to think Nordahl needed to include the entirety of transit planning in his volume. It is a wonderful book for what it is. Granted, as you say, it may convert a more general audience more than the audience of transit planners and designers, so perhaps it’s influence will not be felt where it matters. But I think devoting a book to observing the design details that can make transit more than a from-here-to-there experience is a worthy goal. I don’t think we disagree at all, except that I didn’t find Nordahl’s book especially groundbreaking, because he was saying what I’ve heard architects saying for a decade or more, right down to the specific idea that Disneyland should be an inspiring example. But even if you love Nordahl’s visions, they’re nothing but visions until you take an interest in what they cost, how they fit into larger networks, and what their side-effects are. Understand that, and you’re ready to sort the visions into realistic (F-Market, arguably) and unrealistic. Only then are you able to achieve any kind of change in the world. The F is not, however, an example of your original claim, which is that there is a lot of “very fast transit with very few riders.” I lived in the Castro district for years so am very familiar with the F. The Muni Metro subway under Market Street is often packed, and boardings are particularly intense at the Castro and Church stations (including nearby N and J stops) that compete with the F. So I would reiterate that when we have fast services with disappointing ridership (e.g. SFO BART extension) the explanation lies in the land use patterns served, not the speed. The F is carrying a number of people that looks big on the F but is small in the context of the subway underneath it, and yet I look in vain in Nordahl’s book for an explanation, in terms of his thesis, of why relatively unglamorous transit services like the Muni Metro subway are always so crowded. If Nordahl were arguing that we need to invest a bit more in the subjective quality of experience on high-ridership transit services, I would be cheering. But by claiming that the subjective experience trumps real ridership-driving considerations like speed, he overstates the case to a degree that I think will be misleading. I think this review is spot on, my reactions were much the same. From everything I could tell, the author was completely oblivious to non-esthetic questions, even arguing that ridership was based on esthetics. What scares me is that this reflects a lot of New Urbanist thinking about transit. I have a lot of sympathy with New Urbanist goals, but this kind of thing makes them think they’re informed about transit when they’re not. Riding transit is an experience of being in a public place (and plenty of Americans avoid it for that very reason!) but it’s not only that.